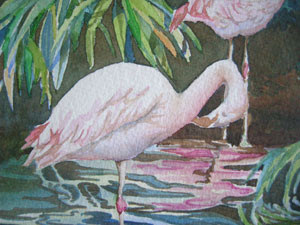 I have used VanDyke Brown as a wash in the background. 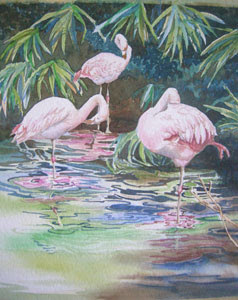 I have also used it to create more shadows on the palm fronds, areas in the water, and to create some of the darker values in the flamingos. Go lightly on the birds! They should look light and airy, not heavily detailed with dark colors! 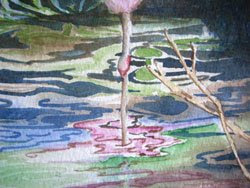 Here is a detail of how the VanDyke Brown was used to create shadows around some of the reflections in the water, along the left side of the bird’s leg, and as a wet glaze near the shoreline. Soften edges with clear water when necessary.